Federal and California laws require employers to post notices informing employees of their rights and protections while performing work for their employers. 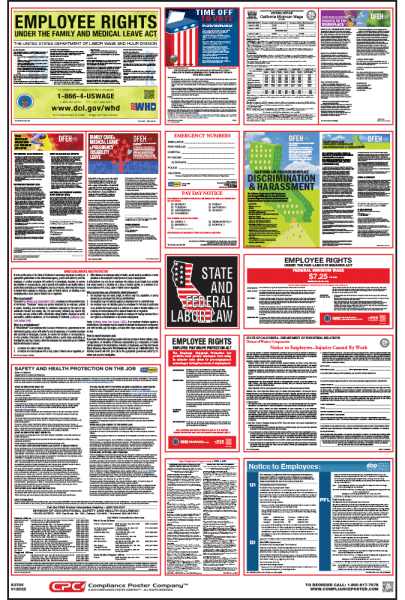 The California Labor Law Compliance Poster contains each of the state and federal mandatory labor law notices that must be posted in the workplace. In California, employers may also be required to post a separate city or county poster depending on their location. California is currently on hold for a mandatory change. Pre-order now to have your California All-On-One Poster shipped to you as soon as mandatory changes are complete. (1343) New law makes sexual harassment training mandatory for all employees. The initial round of training is required during calendar year of 2019. (SB 3) The minimum wage rate is scheduled to increase every year by a specified amount until the minimum wage rate reaches $15.00 per hour for all employers. Thereafter, the minimum wage rate will be adjusted every year for increases in the cost of living. Mandatory Workplace Discrimination and Harassment posting updated with new training requirements and new parent leave. Mandatory Transgender Rights in the Workplace updated clarifying employer obligations regarding unisex and multi-user restrooms. California employers are required to post the IWC Wage Order (1-17) specific to their industry or the occupations of their employees. Required California Workers’ Compensation Time of Hire Pamphlet Must be provided to every new employee, either at the time of hire or by the end of the first pay period. Required California State Disability Booklet Must be provided to each newly hired employee and to each employee leaving work due to pregnancy or due to sickness or injury that is not related to his/her job. Required California State Unemployment Pamphlet Must be provided to an employee whenever the employer discharges, lays off, or places the employee on leave of absence. Required California Paid Family Leave Pamphlet Must be provided to new employees and employees who request leave to care for a seriously ill family member or to bond with a new child. Required Sexual Harassment Pamphlet Must be provided to each employee.